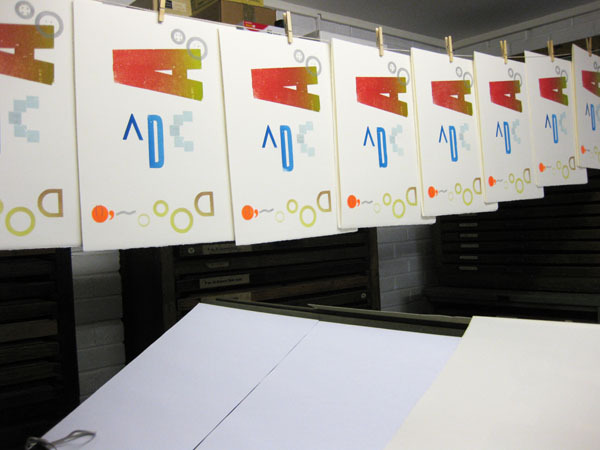 I’ve been printing with Ross and Jon from JMG Studio this weekend – using letterpress we created a set of prints illustrating the poems created by the Liberty School families at the London Voices workshops earlier in the year. Above are the prints before the text went on, with different letters making pictures showing the ice bridge, tiddler trout special party, and hat lemonade buns amongst others. The finished work looks great and will be presented to everyone who took part in the workshops at the celebration event at the park in July. Thanks Ross and Jon, I had a lot of fun and your design was brilliant! This entry was posted in Typography, Workshops on June 7, 2009 by Jane Porter. oooh! looks cool. i love the A! !